Retreat is a valueable moment for us to withdraw from our hectic daily routines, and start an Inner Journey to find inner peace. This is an integral part for those who are seeking spiritual experience through out every religion and spiritual tradition in the world. In Buddhism, retreat is a practice associated to reconnect our soul. It is an integral part on their ultimate goal towards enlightenment and nirvana. In Islam, retreat is indeed an important part of Sufi meditation. In the book “Journey to the Lord of Power (Risālat al-Anwār) by Sufi Mystic Muhiyid-Did Ibn Arabi, retreat was described as a guidance of Inner Journey to find one’s true-self. Sufi understands retreat so well, they had given it a specific name, Khalwat. The word has a deeper meaning, which is a practice to deny one’s worldy desires in preparation for Divine Presence. Sufi perfected their method by chanting God’s name continously as a highest form of meditation for oneself to be close to God. This routine practice is supervised by A Sufi Master. Hindu too has a tradition of retreat. It is best moment for them to have quiet and peace moments to look within and be close to Almighty. In modern days, a week end retreat is an opportunities to withdraw from hectic daily routines to experience innerpeace thru Meditation and Yoga. The purpose for these training are to release stress and re-charge one’s vitalities. Anand Ashram Interfaith Community is founded by various people from many different ways of life, religions, cultures and ethnic backgrounds, thus we appreciate and preserve every teaching from various religious traditions and cultures. We offer a rich varieties of programs for self empowerment, general well-being and healthy life living. One Earth Retreat Centre (under the auspices of Anand Ashram Foundation) was founded by Interfaith Spiritualist Anand Khrisna, PhD as a mean to withdraw oneself from one’s hectic life style, and to live contemplatively in order to evaluate, and empower oneself. While we were in the centre, we aim to use our time wisely to start our #InnerJourney to find our true self and happiness. The centre was established since 2000. One Earth Retreat Centre is an integral part of Anand Ashram Foundation as Centre for Wellbeing and Self Empowerment, where we offer various programs to promote healthy life style and to find one’s true potential in life. Since 1991, thousands have joined and found the programs from our centres are very beneficial to help them to improve their quality of life. These programs were devised by Anand Krishna. 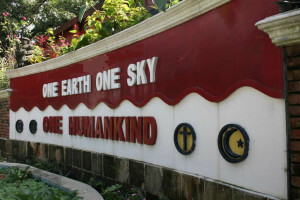 Since 2000, One Earth Retreat Center has witnessed and helped other various organisations dedicated to help humanity in various aspects of education such as FKJ (Forum of Awakening Soul), Institute of Holistic Health, ForADokSi BIP (Forum of Teacher, Doctor and Psychology for Motherland), etc. The vision of One Earth Retreat Centre is to establish ONE big family of HUMANKIND living harmoniously on ONE EARTH, and under ONE SKY. To accomplish this vision, we have mission to provide and promote an experience of Live-in, where we can fill our days with Self-Empowerment, Self-Introspective, Self-Development, Soul Enchancing thru various Inner Journey programs so that we can find our Inner PEACE, do Communal LOVE, and GlobalHARMONY.